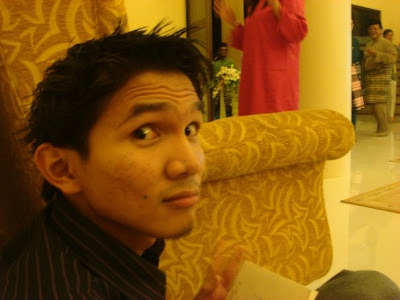 Let me start with Najwa's sis' wedding on the 1st of August. The wedding was held in Najwa's new crib and the house is soooooo Biggy!!!!! and beautiful too... I met some of my old schoolmates there including Dina, Azreen, Yana, Yaya, Habeeb, etc and we had some time chit chatting, exchanging stories, bla bla "stuffs that u usually do whenever u meet ur old friends". 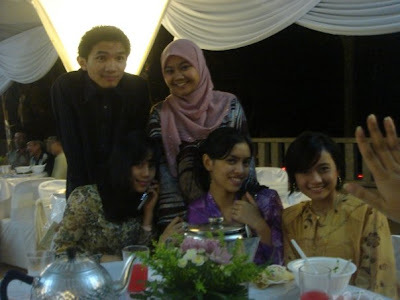 Actually that night was the AKAD NIKAH's night and the bride and bridegroom were soooooo gorgeous in white! hehe me likey2 whitey!! Mak asked me to accompany her the next day to the Bersanding Night at The Grand Blue Wave Hotel Shah Alam. Me and Hamroud met Dr Azmi at his house last monday and he was soo kewl! I think I'm starting to understand Dr Azmi's style on conducting things. He gave us some morale support and motivational advice and I like it. It encourages me to start doing up my FYP works each time I met him! hopefully he can be a really good help to me for this semester and next's.